Exceptional accommodation options, large multi-room bungalows with your own pool, gazebo and outdoor showers. Service with a Polynesia sense of graciousness. Home-made food and catch-of-the-day are regular mouth-watering items on the ever-changing menu. You won’t want to miss out on this gem. Come to Rangiroa – a paradise of dynamic nature surrounded by the vivid blue lagoon. Walk through the palm trees through the entrance to find private guest rooms in traditional Polynesian architectural style. The view of the clear waters of the lagoon behind the rooms glistening in the island sun will take your breath away. 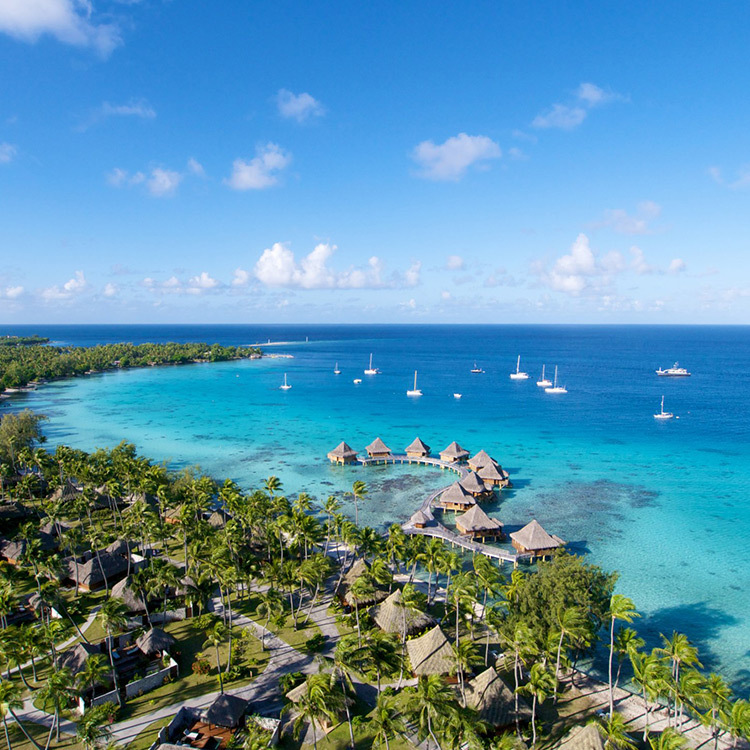 The vivid color and the incredible clarity of the lagoon is fittingly called ‘Rangiroa Blue’ – spend an unforgettable time in this paradise of the blue lagoon, attracting visitors from around the globe. The Hotel Kia Ora Resort & Spa is located on the northern stretch of Rangiroa near the Tiputa Pass. Surrounded by a coconut plantation, the resort combines this convenient setting with a hidden seclusion. The architecture is elegant and refined, resting in perfect harmony with the natural environment. Situated on the lagoon side of the atoll, this is the only luxury option in Rangiroa with overwater bungalows. The spacious and nicely appointed villas and bungalows at the Hotel Kia Ora Resort & Spa are positioned in the garden, on the beach, or over the lagoon. The beach suites have their own Jacuzzi, while the garden villas feature an enclosed yard with private plunge pool. The resort’s shared infinity pool provides an added touch, blending seamlessly into the endless horizon. The main restaurant, Te Rairoa, serves the finest French cuisine in a sophisticated setting, while the adjacent Miki Miki Bar extends over the lagoon for an unforgettable cocktail hour on the water.